I arrived at Guwahati airport at about 10.00am on Saturday morning to clear blue skies and the comfortable caress of a breeze below 45 degrees – a welcome reprieve from the blistering heat of Delhi. 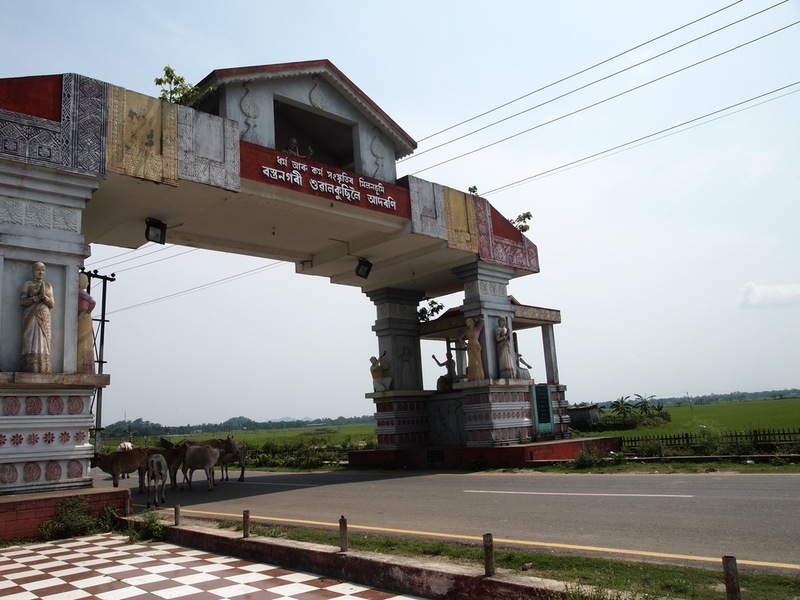 Lokpriya Bordoloi airport is a fair hike out from Guwahati city, surrounded by flat green farmlands and rural style brick and bamboo Assamese houses. I wrangled with an auto driver out the front of the airport for a sound tourist fare of roughly four thirds of the price and hit the road out to Sualkuchi. Sualkuchi is about 40km outside of Guwahati, situated on the far side of the Brahmaputra river that runs north of the city. Once across the river and out of the dust and grime of Guwahati, the drive turns into a scenic meander through the neighbouring villages along the river. My port of call was the home of a lovely woman named Mitu, who runs a medium sized handloom shed just outside of Sualkuchi. I first met with Mitu a couple of months earlier when we first came to scope out the weaves of Sualkuchi. 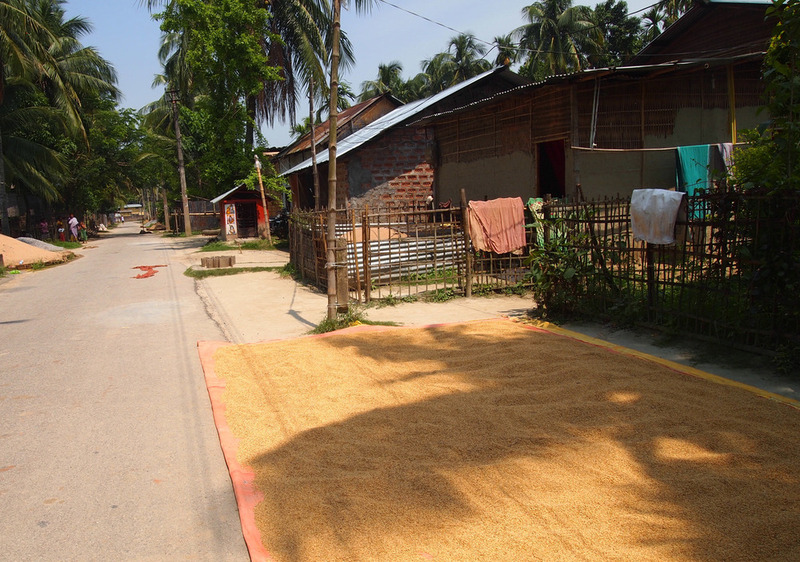 Sualkuchi is often referred to as the ‘Manchester of Assam’ for it’s association with silk, and is one of the largest silk villages throughout Asia. However when I first arrived in Sualkuchi my first impression was not that of an industrious weaving hub, but rather a sleepy little Indian village. 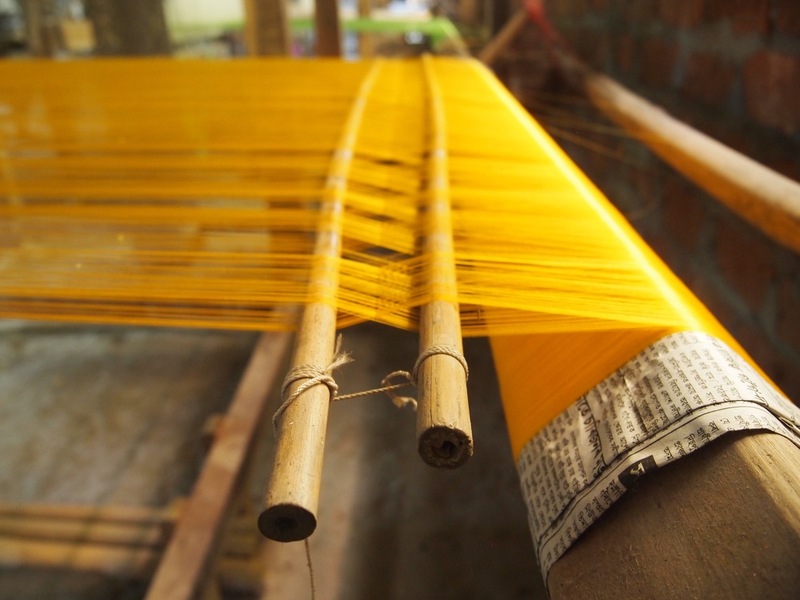 It was only after walking off the main roads and out of the township that you can hear the clacking sounds of handlooms in action coming from just about every household. Sualkuchi has been built up from a cottage industry village dating back centuries, (some hold as long as 4th century BC ) when it was once a craftsmen’s village of weavers, goldsmiths and potters. Today it is just the weaving which has survived the changing manufacturing landscape in India and centralisation of production as major cities have grown. Mitu’s house was a bustling whirlwind of activity as soon as I entered. Typical of an Indian family household there was a number of extended family members staying together (I can never keep track of Indian terms for each family relation) as well as a new baby brother for Mitu’s rambunctious five year old son, Riyan. After greeting everybody again I sat down with the women for lunch, which was a lavish spread of vegetable and meat dishes accompanied by the mountainous pile of rice synonymous of every Assamese meal. No-one in the family spoke any English so where my Hindi couldn’t bridge the gap I did spend a fair amount of time smiling bemusedly at the close knit family’s interactions. After nearly a year away from home, suddenly being a (if only honorary) member of a family’s simple, every day routine left me with a strange yet comforting homely feeling. While most houses in Sualkuchi produce silk on a small scale, some families have established more efficient domestic systems whereby the weavers work in the handloom sheds and live in on-site accommodation. A lot of the women also had small families living with them, and sent their children to neighbouring schools. Whilst this might conjure images of sweat shop-esque operations where workers live and sleep on factory floors, the reality of these women was quite different. Weaving started anywhere from 7am to 10am, with a two to three hour lunch and siesta at midday before weaving commenced again for the afternoon. 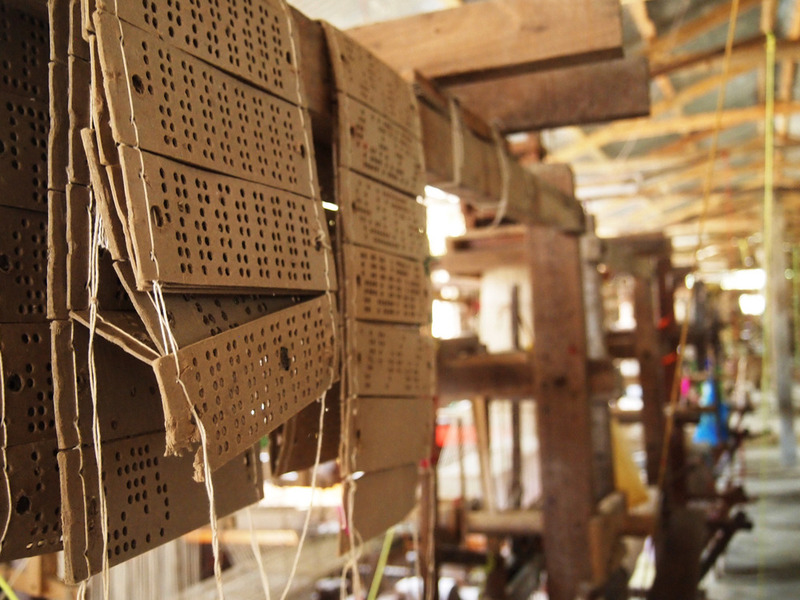 Learning about the intricate designs achievable on the the jacquard looms was an eye-opening experience for me. My weaving knowledge was minimal at best prior to arriving and the incredibly complex looking card system confounded me. Translating my ideas from sketches and graph paper printouts to a design the card cutting master could understand was a face-palming exercise for the poor guy. The weave I ended up finalising was a much more simpler design than the original I set out to conquer (photos to follow soon) however learning the process firsthand will be invaluable for realising future weaves. I enjoyed temporary celebrity status during my time in the village, which proved to be exhausting by the time my visit drew to an end. One afternoon I emerged from my room only to find myself face to face with a blockade of around 15 young kids from the village all waiting patiently for a 'selfie.' Getting such an intimate insight into the day to day life of a rural Assamese family was a treasured experience and I have no doubt I'll be back on the road to Sualkuchi again in the not so distant future.